View More In Fuse Blocks & Fuse Holders. 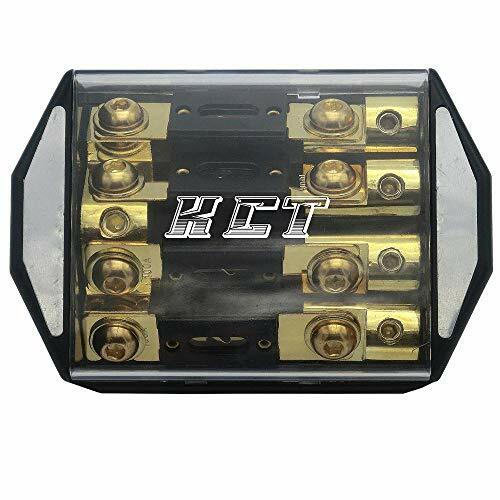 This 100Amp power distribution fuse holder is made out of high quality materials in order to get professional results from your car subwoofer audio system. This fuse block holder designed for high performance car audio systems and other electrical high current applications. The power fuse compartment geared up with a heat-resistant acrylic covers and corrosive resistant materials such as gold-plated finish. The new style engineering design makes your installation safe and stylish. Gold Plating Terminal Fuse Block, 4X100A Fuse Included. If you have any questions about this product by KCT, contact us by completing and submitting the form below. If you are looking for a specif part number, please include it with your message.